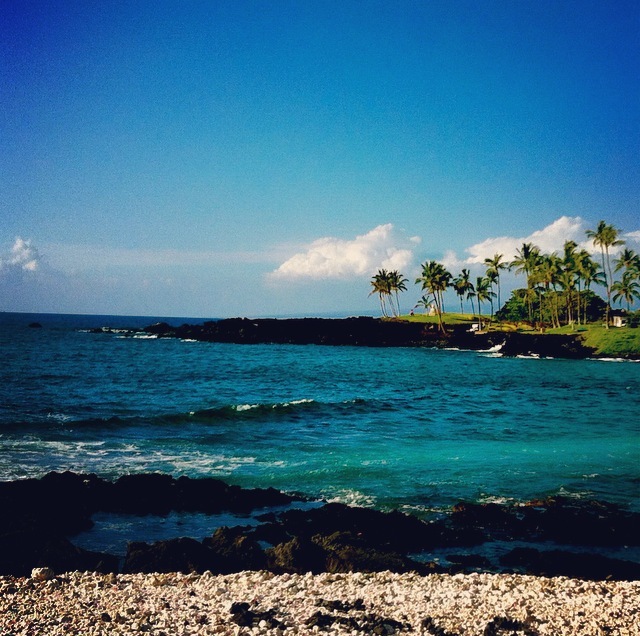 This photo was taken 2 years ago along the Kona side of the Big Island of Hawaii. The Big Island is home to volcanos, observatories, coffee plantations, breweries, and of course the Mauna Loa Macadamia Nut Factory. I just love macadamia nuts don’t you? In Hawaii macadamia nut products are everywhere and they are significantly cheaper than on the mainland. 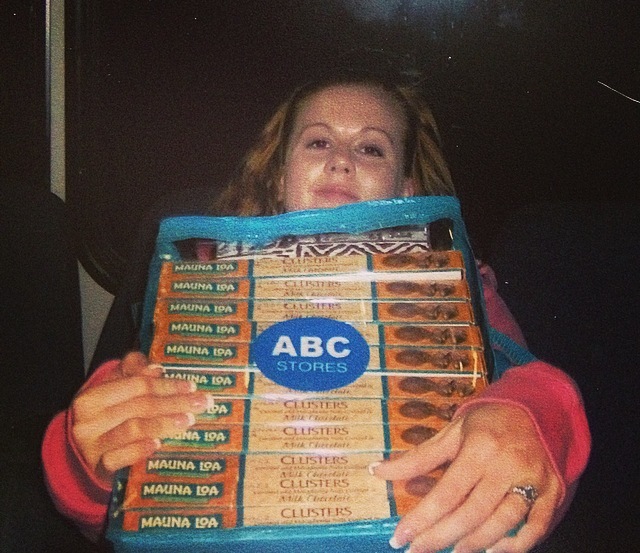 When ever we visit Hawaii you can bet I’m always coming home with at least one box of Chocolate and Caramel Macadamia Nut Clusters…. Sometimes it’s the whole case. Although did you know that the macadamia nut tree isn’t native to Hawaii but Australia? The macadamia nut was brought to Hawaii in the 1880s. While exportation started in the 1930s it wasn’t produced on a large commercial scale until the 1950s. Shortly there after came the favorite White Chocolate Macadamia Nut Cookie. As I have mentioned before my husband and I run our own Hawaiian themed school fundraising company here in Texas called Big Kahuna Fundraising, and one of our main products we sell is cookie dough. While chocolate chip cookie dough will almost always take first place (it’s the favorite of every kid), the white chocolate macadamia nut cookie is a very close second and always a favorite of the adults. For my Hawaiian “Big Kahuna” Luau I’ve taken a traditional white chocolate macadamia nut cookie recipe, added a little coconut extract, and transformed it into a blondie. 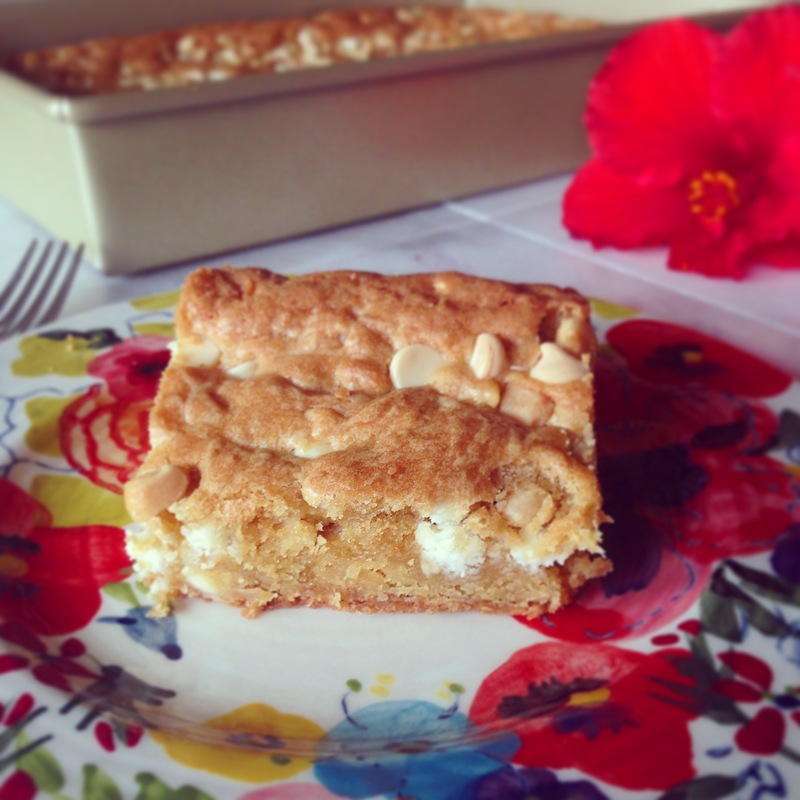 And these “Ono” White Chocolate Macadamia Nut Blondies will whisk you away to the land of Aloha in just one bite. 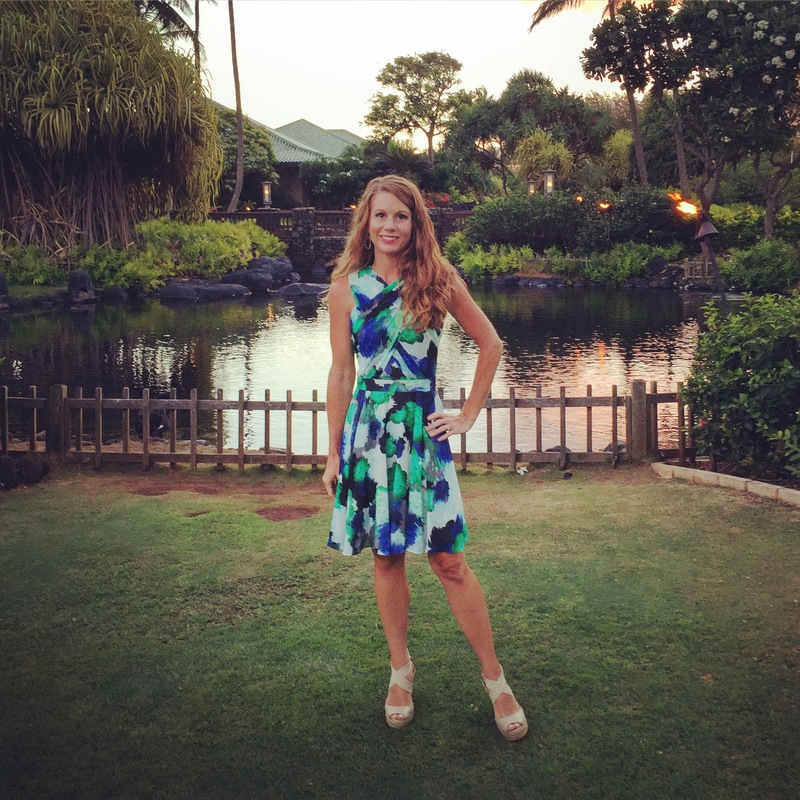 Here is a link if you would like to learn a few other Hawaiian Words and Phrases. Beat together the butter, sugar, and brown sugar in the bowl of a stand mixer fitted with a paddle attachment until light and fluffy, about 5 minutes. Add in the eggs (one at a time), vanilla extract, coconut extract and beat until the eggs are incorporated, 2-3 minutes. Sift together the flour, baking powder, baking soda, and salt. With the mixer on low speed, slowly add the sifted dry ingredients. Scrape the bowl down and mix again for 30 seconds. Mix in the white chocolate chips and the macadamia nuts reserving 1/4 cup of each. Grease a 9×13 pan and spread out the batter in an even layer. Top with the remaining white chocolate chips and macadamia nuts. Oooo. Delicious looking blondie. I love blondie’s. Not a cookie and not a cake….something in between. Best of two worlds!